Observation - Tufted duck (female) - UK and Ireland. Description: A diving duck, dark brown in colour with small bright round eyes. Colour suggests it could be a female tufted duck. 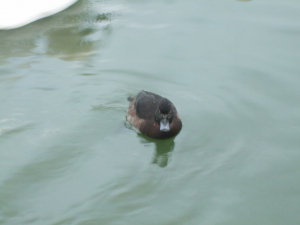 A diving duck, dark brown in colour with small bright round eyes. Colour suggests it could be a female tufted duck.